​"The Soup Nazi" was the 116th episode of the NBC sitcom Seinfeld on November 2, 1995 and the classic spoken words became part of pop-culture instantly. A little known fact is that actor Larry Thomas perfected his portrayal of the Soup Nazi by studying Omar Sharif's accent in Lawrence of Arabia. Question: How does this translate to sales? Answer: It is a great example of not understanding the buying/selling process. Making assumptions, asking the wrong questions, not knowing the roles and needs of the players, and not having the relationship you need. All of these combined will earn a "No Sale For You!" from your prospect and be reiterated from your Sales Manager when you have to explain what happened. How would you like to have a sales funnel full of higher value opportunities that have a shorter sales cycle? ​This post has to do with the 5 ingredients of a sale that determines the probability of you closing the deal. Most sales people do not ask the right questions and do not understand all of the moving parts that have to align for a sale to happen. They rely too much on their "gut" feeling and it is usually wrong. Question: How many opportunities in the funnel get lost at the negotiation phase with a 90% probability rating? The first part of the problem exists inherently in CRM systems and their sales funnel stages. Most CRM systems automatically assign a probability based on the assigned sales stage. This is a terrible link and it should be removed if you can edit the system you are using. Probability should have it's own stand alone data field that you can manually enter. Question: How do you take the "gut feeling" out of the probability figure? Answer: The probability to close should be based on an objective score that everyone uses the same way. The second part of the problem exists from sales people using different criteria about how their sale is progressing compared to the what is really happening. As sales people, we believe we can land all of the opportunities. The fact is that we will only close 10% of the sales and waste valuable time on the other 90%. That time could be used to pursue higher rated business that had a greater probability to close had you only understood what the actual probability was. Question: What are the five sales ingredients that we need to use for probability? Answer: Budget, Authority, Need, Timing, and Trust. Each one of these ingredients has a 1-20 point potential with 20 being the highest. If each ingredient is identified and exists, then you should have 100 points or a 100% chance to close the deal. This process is known as "BANTT"
​Let's look at these five sales ingredients individually. In the next blog, we will give you the questions you need to ask that will help you assign them a score. Budget: How many times have you presented a proposal only to have the prospect choke or have a small seizure? How much time did you spend developing that proposal? Does the prospect have the money to purchase what you are offering? Are they actually looking for a solution or just window shopping? Are they going to make you their vendor or just hold their current one accountable with the price you provide? Have you made a legitimate case that would help them justify the spend on your product or service? If they don't know their budget or what they spend now on a similar solution, it scores a zero. If they know the cost and understand the price of not integrating your solution, then it is a 20. Authority: How many times have you presented a proposal only to hear "I'll give this to my boss to look at"? Are you speaking with the decision maker? Are you talking to the person that can give you money or is the person you are talking to just a messenger? Do they have any stake in the process at all besides making you go through the motions? If you are dealing the person that can hand you a sack of cash, it scores a 20. Need: We hate saying "no" as sales people but at the end of the day, you need to be able to identify if this future client is a the right fit for your business. Is this client in your "wheelhouse"? Can you deliver the solution they need without any customization that drives the operations team nuts and hurts the profit margin? Can you deliver what you are promising without making excuses later? If this is an ideal client that will have a long lifetime value, it scores a 20. Timing: What is your targeted sales cycle. If it is 3 months, then you need to focus on those prospects who have a 3 months buying window. If your prospect is not looking to buy for 24 months but you "think" they will close because you like the same sports team, guess what, the line for the crazy train just got one person longer. Is this prospect looking to make a purchase in the next 90 days or are they trying to plan for 24 months out to prepare the CFO for the check he might have to write? Will this opportunity make an impact on your bonus this year or is it a something that might never happen. Don't make any major purchases yet. If they are going to make a decision in your targeted sales cycle, it scores a 20.​ If they are just shopping, it is a one. Trust: What have you done to make yourself the obvious choice? Do you have a seat at the table or is your competition in the seat? I guarantee you are not the only option the prospect has. If you were, you would not be reading this and I would be reading your book that you wrote on the island you own. By identifying these five sales ingredients earlier in the sales process, your sales funnel will be filled with higher value opportunities that have a shorter sales cycle. How can that not be good for your wallet and the company profit and loss statement? Want to improve your probability? 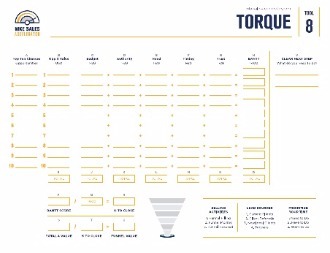 Drop us a line and we'll send you our "Torque" sales tool that will help you identify where you need to ask better questions. You can email us here and please write "torque" in the subject line.